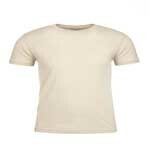 Bella+Canvas STYLES 3001 AND 3001CVC Unisex 4.2 Ounce Jersey Short Sleeve T-Shirt. Side-seamed. Retail fit. Unisex sizing. Shoulder taping. Tear-away label. 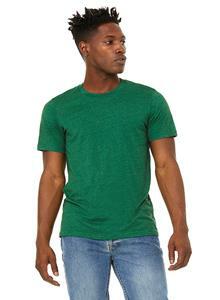 Solid Colors: 100% Airlume Combed and Ringspun Cotton, 32 single 4.2 oz. Ash made from 99% Airlume Combed and Ringspun Cotton, 1% polyester. Athletic Heather & Black Heather made from 90% Airlume Combed and Ringspun Cotton, 10% polyester. Heathers made from 52% Airlume Combed and Ringspun Cotton, 48% polyester. Sizes XS-4XL: STYLE 3001 COLORS: Neutrals: White. Colors: Aqua, Army, Ash, Asphalt, Autumn, Baby Blue, Berry, Black, Brown, Burnt Orange*, Canvas Red*, Cardinal, Charity Pink*, Coral, Dark Gray, Dark Olive, Deep Teal, Evergreen, Gold, Kelly, Leaf, Lilac, Maize Yellow, Maroon, Mauve, Military Green, Mint, Mustard, Natural, Navy, Ocean Blue, Olive, Orange, Oxblood Black*, Pebble Brown*, Pink, Red, Silver, Soft Cream, Soft Pink, Steel Blue*, Storm, Sunset, Tan*, Teal, Team Purple, True Royal, Turquoise, Vintage Black, Yellow. STYLE 3001CVC COLORS: Athletic Heather, Black Heather, Dark Gray Heather, Deep Heather, Heather Aqua, Heather Autumn, Heather Blue, Heather Brown, Heather Clay, Heather Columbia Blue, Heather Dust, Heather Dusty Blue, Heather Grass Green, Heather Green, Heather Ice Blue, Heather Kelly, Heather Lapis, Heather Maroon, Heather Mauve, Heather Military Green, Heather Mustard, Heather Navy, Heather Olive, Heather Orange, Heather Orchid, Heather Peach, Heather Prism Blue*, Heather Prism Dusty Blue, Heather Prism Ice Blue*, Heather Prism Lilac, Heather Prism Mint, Heather Prism Natural*, Heather Prism Peach*, Heather Prism Sunset*, Heather Raspberry, Heather Red, Heather Sea Green, Heather Slate, Heather Stone, Heather Storm, Heather Sunset, Heather Tan, Heather Team Purple, Heather True Royal, Heather Yellow, Solid Black Blend, Solid White Blend. *Colors Ship From Los Angeles, CA.